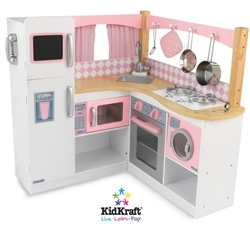 This is for one Brand New 36" Pink & White Wood Pretend Play Kitchen Set with Accessories. 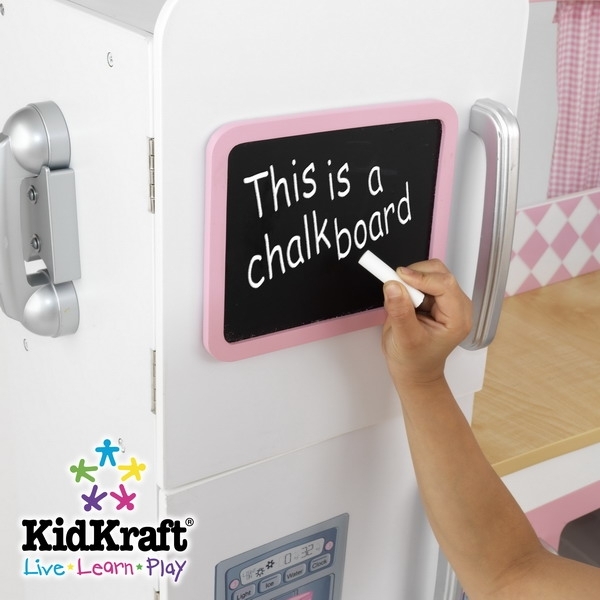 Playing with The KidKraft Grand Gourmet Kitchen will make any kid feel like a world-class chef. This deluxe kitchen is loaded with fun details, including an innovative structure and an entire set of metal accessories. This wooden kitchen set has everything your kids need to prepare the imaginary meal of their dreams! With realistic features including a sink, an oven, a microwave, and more, pretend time just gained an entirely new dimension. Made from Wood, MDF Board, with fabric curtain and metal accents all included. Weighs 60 lbs in the box.